Our little local grocery store has a pretty good butcher department. They always carry cuts of meat not often available in other national chains. I like to go there early Saturday morning when they are stocking the shelves and look for inspiration. 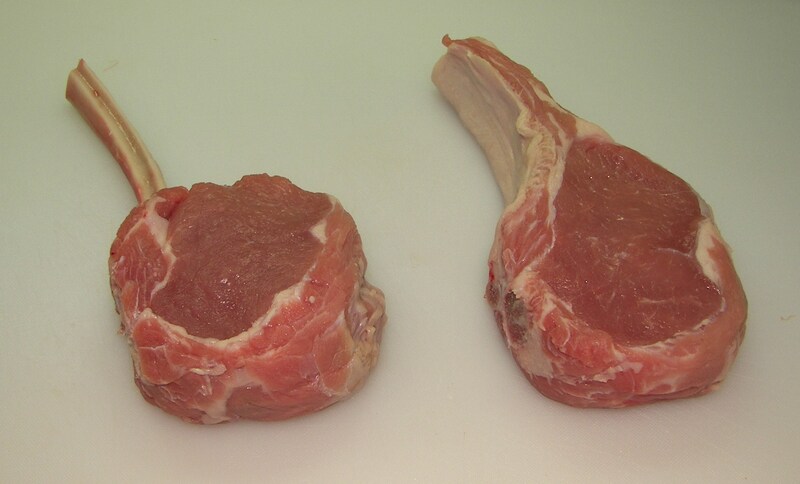 Veal rib chops are usually always available. Their affinity for the grill makes them warmer weather fare in our household. Recently, I had a craving for Veal Milanese. This ubiquitous dish can be found in Paninotecas throughout Italy and many of the old school Italian restaurants here in the States. It consists of tender medallions of veal, pounded thin and coated in a golden brown bread crumb crust. A squeeze of lemon completes the dish. 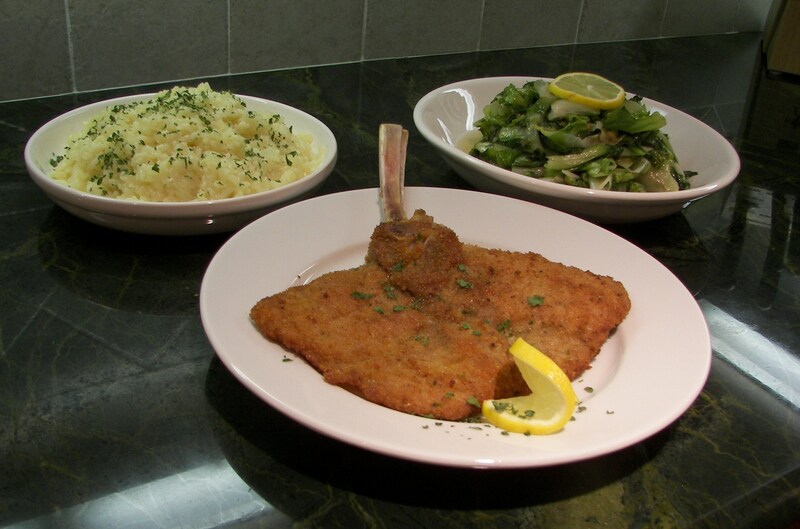 Veal Milanese is an easy recipe to prepare and a good choice for casual entertaining. It is equally delicious served hot out of the pan or at room temperature. This flexibility enables the hosts to either prepare them ahead of time or after their guests have arrived. Veal scaloppini and chicken cutlets work equally well with this recipe. Have the butcher cut the chine bone off the chops so only the rib bone remains. This will help the chop lay flat in the pan after it’s been butterflied and pounded flat. 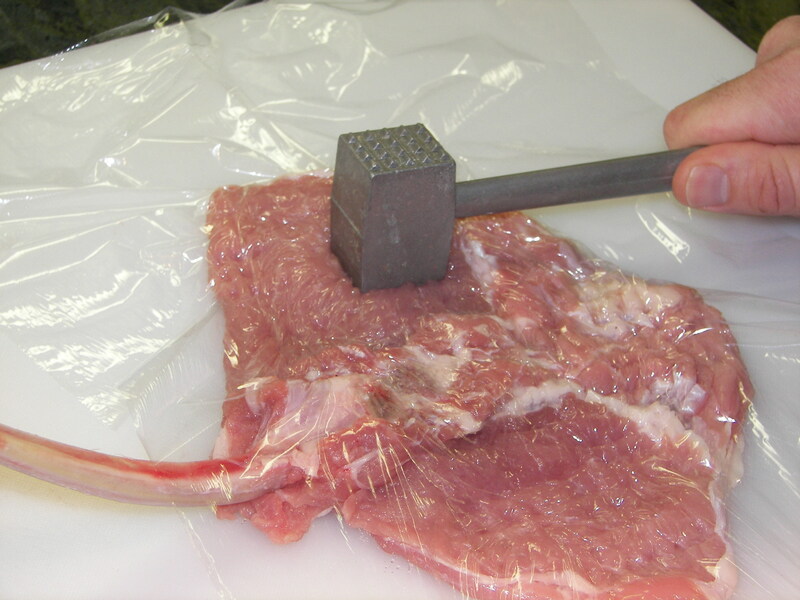 French the chop by cutting all the meat from the rib bone. Scrape the bone with the side of the knife until it is clean. 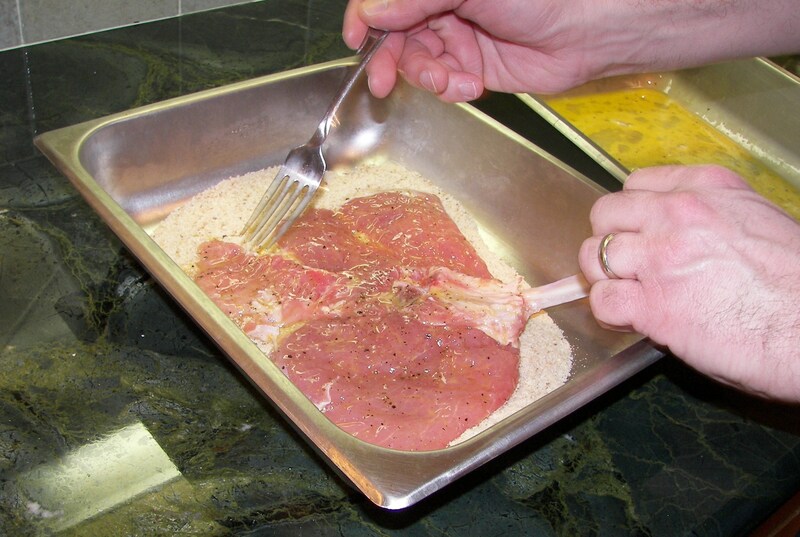 A round medallion of veal should remain after the chop is frenched. It should look like the number “6”. Using a heavy handled boning knife will make this process easier. To butterfly the Veal, lay each chop on a cutting board. The bow of the rib bone should be facing up. The medallion of meat should be sitting upright on the bottom edge of the bone. Slice the chop in half beginning on the top side of the meat and working your way down toward the bone (See photo below). This will create two flaps of veal each half as thick as the original chop (If the original chop was 1” thick, there should be two ½” medallions left after slicing). Make sure you do not remove the medallions from the rib bone. Flip the chop so the end of the rib bone is now pointing up. Spread each flap of the veal so the chop is laying flat on the cutting board. The rib bone should be centered between the two medallions. Place a piece of plastic wrap over the chop and pound each side thin with a meat tenderizer (The bottom of a small pan will work equally as well). If each side of the chop was sliced to 1/2” thickness before tenderizing, they should be ¼” thick when you are done. Heat the Olive Oil in a frying pan large enough to hold one chop when it is laid flat. The amount of oil should be sufficient enough to cover the bottom of the pan, but not submerge the chop. The chops will be dipped in egg wash and bread crumbs before being fried golden brown. To create an efficient work space, arrange two separate pans in close proximity to the frying pan on the stove. Each one should be large enough to fit an entire chop. Crack and beat the eggs into the pan furthest from the stove. Place the bread crumbs into the middle pan. Season each chop with salt and pepper. Using the rib bone as a handle, dip the first chop into the egg wash, making sure each side is thoroughly coated. 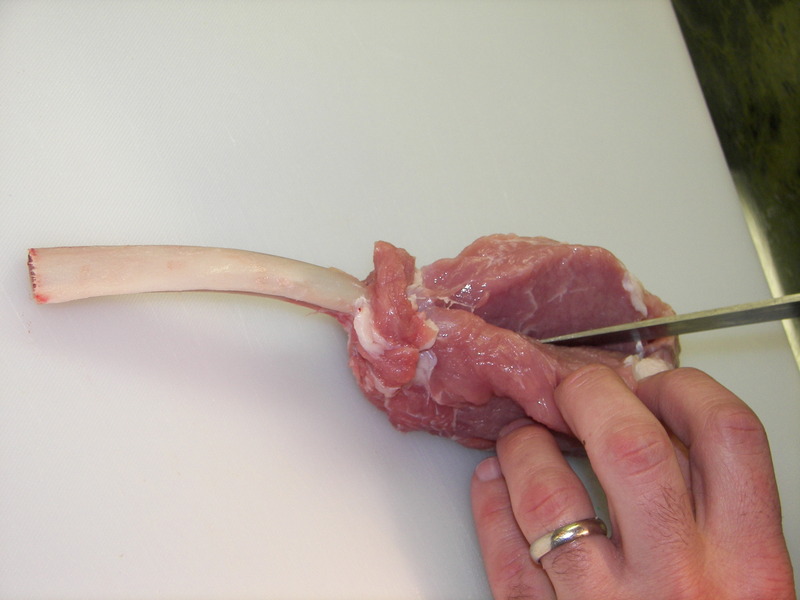 Use a fork to help spread the flaps of veal open. Try not to get any egg wash on the stem of the rib bone. Lift the chop out of the egg wash, allowing any excess to fall back in to the pan. Dredge the chop through the bread crumbs making sure an even layer is adhered to each side. Press down gently with your hand to make sure each side this thoroughly coated. Note: In classical French cookery the process of applying a bread crumb coating is called “a la Anglaise”. 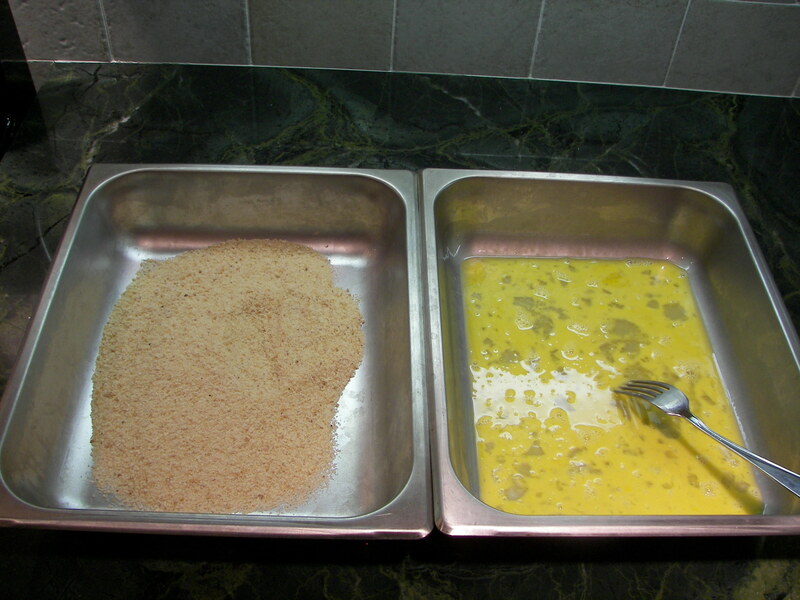 Traditionally, this technique requires the main ingredient to be dusted with flour before being dipped into the egg wash-breadcrumb mixture. The flour prevents the coating from actually adhering to the meat. After frying, it forms a shell around the main ingredient that seals in moisture and flavor. It can be easily scraped off when fully cooked. 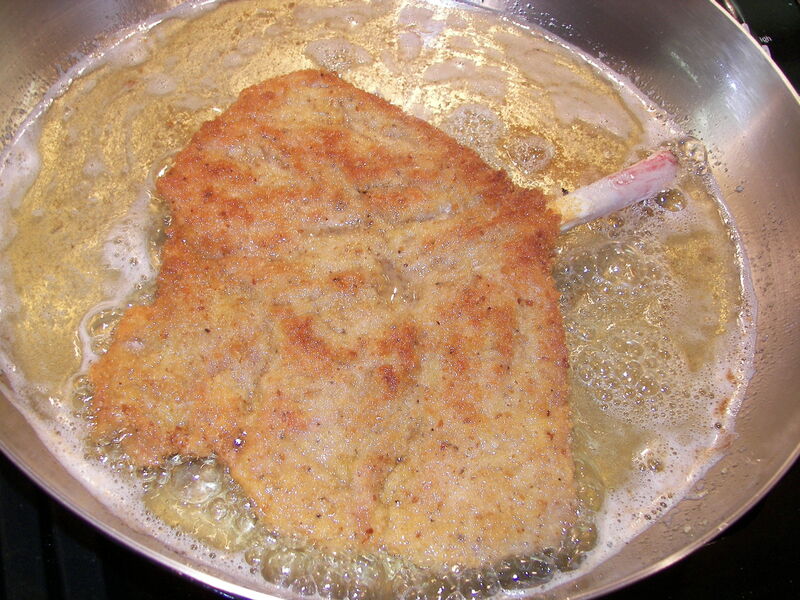 For Veal Milanese, the flour is omitted because desired result is to have the breadcrumbs adhere directly to the meat. When the oil reaches the proper temperature (350 to 375 degrees), add the first chop and fry until the bottom is golden brown. Flip the chop and brown the top side. If the bow of the rib bone prevents the base of the chop from browning, increase the depth of the oil around it by tilting the pan. Remove chop from hot oil and place on folded paper towels to blot any excess oil. Repeat process with second chop. Squeeze fresh lemon over the chops right before serving. Serve with Saffron Risotto and sautéed Escarole.